Cover the bread crumbs with warm water for 10 minutes. Squeeze out the excess water. 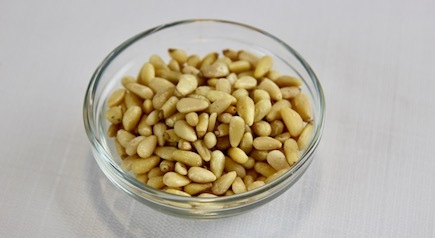 Put Pine Nuts, moistened bread, garlic, salt, and cayenne pepper in a food processor. While mixing, slowly add the lemon juice. Blend till the sauce is rich and creamy. If needed for creaminess add a little water and blend into the mixture. Can be stored in a refrigerator for 1 week.